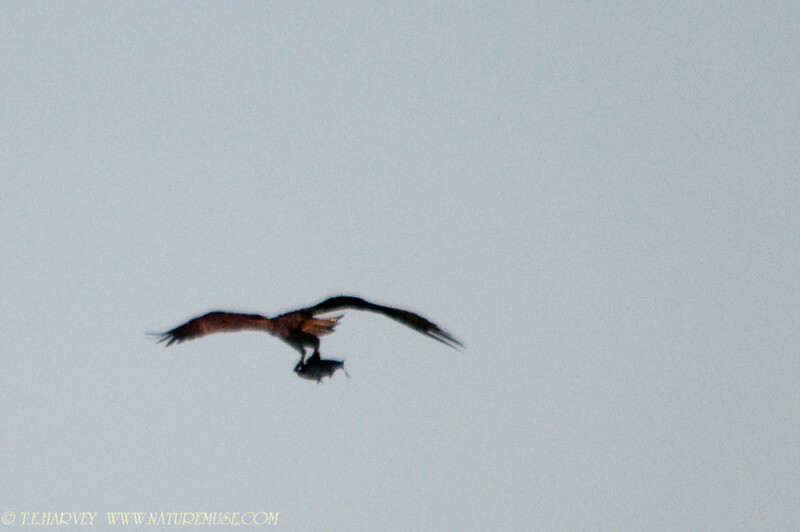 Photos illustrate the story of an Osprey fishing, diving and catching an extremely large fish at Mason Neck Wildlife Refuge (VA). Photographic quality is not very sharp due to distance and difficulty in focusing. However, the Osprey's 10 second struggle in the water and difficulty getting out due to the fish's weight is apparent. In addition, one can observe as flight progresses, the Osprey has rotates the fish towards the direction of flight to reduce aerodynamic drag. Elapsed time from the initial hovering above the fish, to the catch and flight to a tree was about 3 minutes with time in water about 10 seconds. These are best viewed in fast slide show mode. Higher altitude and fish is positioned in the direction of flight.